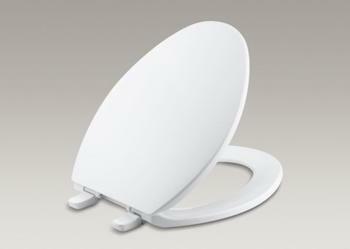 We don't ask too much of toilet seats, but we do expect them to provide a safe and secure seating area. That's something Kohler promises in its description of the Brevia, a seat that it says "complements a wide variety of elongated toilet designs." The Brevia features "Quick-Release™ hinges [that] allow seat to be unlatched from toilet for easy removal and convenient cleaning; no tools required," according to the description on Kohler's website, which touts the seat's "Quick-Attach® hardware for fast and secure installation." Could be, but George of Sun City, Ariz., says his Brevia seat has proven to be anything but secure. In a ConsumerAffairs video review, the 91-year-old says he has fallen twice in less than a month when the seat unexpectedly detached. George said he avoided serious injury only because of the grab bars on his bathroom wall and said that had it not been for those bars, he would have been making a 9-1-1 call instead of submitting a video review. The seat looks nice but has "no structural strength" and should be recalled as a safety hazard, George said. George and other consumers who encounter unsafe products should report them to the U.S. Consumer Product Safety Commission's online complaint page as well as filing reviews with ConsumerAffairs and other sites.